Hello, this is Matsushita writing. I hope you all are fine in the busy days of December. Dog Ear Records is also working hard to start the fantastic new year. 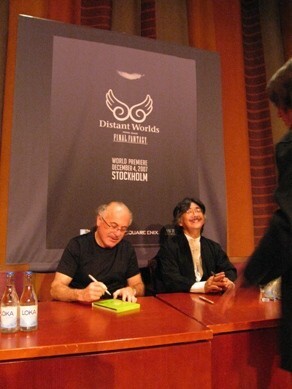 Our December started from the "Distant Worlds music from FINAL FANTASY" at Stockholm which wappa wrote the report in last entry. After the stockholm concert, I went to Nagoya and Osaka on Nov.18th with master Nobiyo, and also with Mr.Kondo from Nintendo-the legendary composer who wrote the songs of "Super Mario Brothers" & "Ledgend of Zelda"- to do the lecture at the music school "HAL". 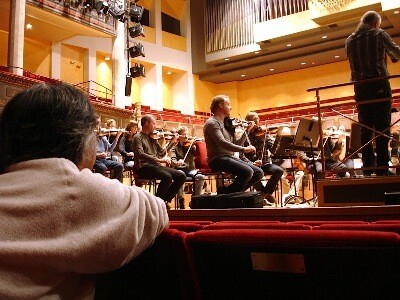 The students of HAL were all looking with earnest eyes, and listening to what those two composers talks. This was the first time for me to meet and talk with Mr.Kondo formally, and I'm a big fan of his music as same as Nobiyo's and Mr.Kouichi Sugiyama's music. I was tensed that time (though I'm already 40 years old), but Mr.Kondo was extremely kind and polite to us, and I became his fan more. On Dec.20th, we did the instore event of "Tsukino Akari -Theme of Love-" at Shibuya HMV, and release event of "Anata Wo Yurusanai Original Soundtrack" at Shibuya TOWER RECORDS. 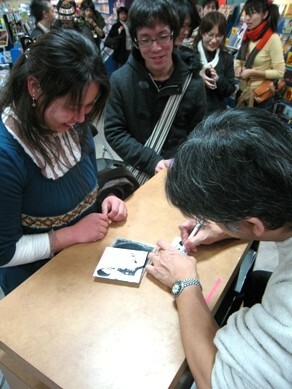 Thank you to the fans who came to both of the events! Through that day, the most hard worker was master Nobiyo. I'm always impressed by him that he always have a lot of energy. There is nothing more valuable than health! 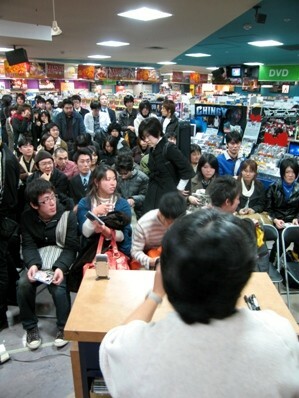 The event at Shibuya HMV was arranged by the BMG JAPAN, the publisher of the song "Tsukino Akari". And the director of the song was Tsuyoshi Takemura, who was my junior worker when I was working for the company"Digicube". I was so happy to see his remarkable growth as a record director, and was a impressive event. An encounter with someone is very important, and working again with old coworker as the other position is really fantastic! I wish everyone good luck for the coming year! Meeting with your old friends during your holiday is maybe nice! ※The pictures below are the release event of "Anata Wo Yurusanai Original Soundtrack"
The event was held at the 4th floor of Shibuya TOWER RECORDS. Thanks for taking time in your busy weekday night to come to the event! After the talk session ended, the signing session started. 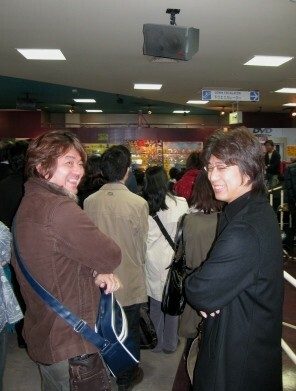 On the tail of the audience, I found Mr.Michio Okamiya who is the guitarist of The Black Mages. 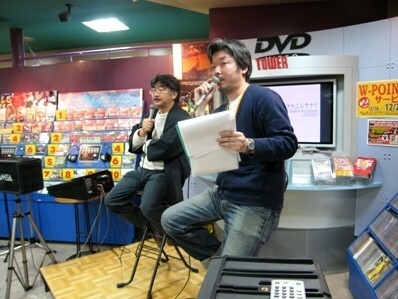 And also Mr.Kenichiro Fukui whom finished playing the keyboard for the song "Tsukino Akari-Theme of Love" at Shibuya HMV!